On 15 December 1851, on the Forest Creek diggings in central Victoria, 15,000 gold diggers attended a protest meeting – The Monster Meeting. This was the first mass anti-government protest in Australia. The diggers met to defy the Victorian Government’s unfair Gold License – and in doing so they began a movement that led to the Eureka Stockade in 1854, and set a path for democracy in Australia. This website is to commemorate and tell the story of the Monster Meeting. The Forest Creek goldfield is now within the towns of Chewton and Castlemaine, and unlike other locations of the 1850s gold rushes such as Bendigo, Ballarat and California, the diggings are still in the landscape for all to see – including the Monster meeting site at Chewton. The Victorian Government’s Gold License was a fee imposed to dig for gold, whether a digger found any or not. It’s main purpose was to keep the ordinary worker in his or her regular job. But it failed, and there were 25,000 people digging for gold on Forest Creek. So in December 1851 the Government moved to double the licence fee – and an estimated 15,000 angry diggers attended a meeting to protest. Want to dig a little deeper? This page has historical maps and documents, historical articles, speeches and links to other sites with even more information. Here you will find archival images from the times, slide shows of our annual Monster Meeting re-enactments and the 2012 Gala concert that launched our Monster meeting double CD. This page introduces the 2012 Monster meeting Project. 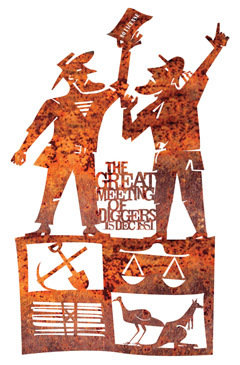 Using song, story, research, film and this website, we tell the story of The 1851 Monster Meeting of Diggers, on a double CD containing the story and the best songs from the 2010 Monster Meeting Song Award. And coming in 2013 will be the Monster Meeting Archival Collection and a documentary film. Our Youtube channel has extracts from the Monster Meeting songs, re-enactments and archival clips. Follow us on facebook for late breaking news to your newsfeed.